In comparision to strip surgery, FUE generally leads to higher patient satisfaction and quicker recovery. The donor-area and the recipient-area hardly show any signs of the surgery. MY HAIR CLINIC is among the few hair transplant centres world wide to specialize in FUE hair transplantation to ensure best results for the patients. In FUE hair restoration, individual hair follicles are extracted with minimal trauma to the scalp. As every single follicle is extracted individually this is a time consuming procedure. The benefit is that a controlled and careful extraction of donor hair is very lenient to the skin and scalp. Complications are rare, and the donor-area shows little sign of the procedure within few weeks. Few months after the procedure the donor-area usually heals fully. With strip surgery a strip of skin containing hair-follicles is cut from the back of the head. The strip size can vary but is typically 1-1.5 cm wide, 6-8 mm deep, and up to 30 cm long going from ear to ear. Removal of the strip leaves a large opening in the back of the head which is sutured putting tension on the edges. Even the most perfectly performed strip-surgery will leave a linear scar and patients may suffer from numbness and pain and have problems covering the strip scar. Needless to say that the visibility of the strip-scar looks bad and can cause great distress to the patient. 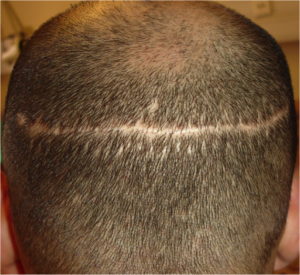 If you are an unhappy patient left with a strip scar you can read about repairing strip-scars at MY HAIR CLINIC. 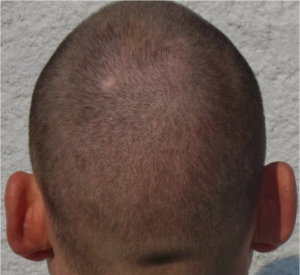 We have listed the advantages and disadvantages of FUE hair transplantation versus strip-surgery (also called FUE and FUSS) below.